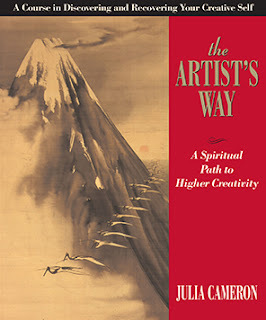 I’ve owned a copy of The Artist’s Way for maybe ten years, but never actually started it (I did two days of morning pages when I first bought the book but immediately fell out of the habit and never picked it back up). Such is the life of a lot of my textbooks and workbooks. But I’ve decided that 2018 is the year I scale the foothills of my to-read pile; TAW is on the list, so here we go. I’m starting by reading through the book before beginning the program, and I can already feel this is going to be a slog. I understand that The Artist’s Way is based on a 12-step program and that surrendering to a higher power is part of that, but I’m not as religious as I once was and the frequent references to God/a creator are off-putting. In the early chapters, the tone is overly reassuring – bordering on coddling – and I feel spoken down to. Maybe it’s something other people will get more out of, but it’s not my thing and reading it was more a case of pushing through than actually enjoying it. The early chapters didn’t throw anything up that I felt strongly about; I’ve been seeing a therapist for a while now, so maybe I’ve already worked through some of the baggage these chapters are designed to help with. Certainly, week one’s “write a letter to the editor in your defence” sounds like behaviour I would have indulged in a long time ago, but now it just seems silly. I’ll still do it – I’m either going to go through the program properly or not at all – but I don’t know how much I’ll get out of it. Weeks three and four sound much more difficult. The idea of being ashamed of creating, of seeking impossible acceptance, already raises some feelings, and I’m so immediately opposed to the idea of reading deprivation that I know it’s going to throw up something profound. The weeks get harder as they progress (obviously), digging deeper into things I thought I’d dealt with already but just reading the chapter immediately flags these up as something I’m going to have to work at. Week seven is about perfectionism and jealousy, two things I thought I’d grown out of, but – even just skim-reading the book for an overview – I’m remembering feeling jealous of people for this or that as recently as a few weeks ago. Maybe it’s not something you ever grow out of , but we’ll see what’s under the surface. Week eight is going to be looking at anxiety and procrastination. The notion of being too old is something I particularly struggled with in my 20s , and I still have Feelings about this topic, apparently. Weeks nine and ten are about confronting fear disguised as self-recrimination, and self-sabotage respectively. I have an inkling this will be another emotional fortnight; I can feel the shape of the things I’ll be dealing with in these areas, even if not the fine detail. The later exercises had less focus on letting go and letting the creator work or, at least the focus was less obvious. The last two chapters are about support systems and self-care and there’s an refrain that reminds me of a number of other books on creativity and the process of making art – that great artists share and they support each other. That the process of making art is an end unto itself, and that any fame and fortune that might or might not come with that is incidental. My therapist said that all the self-help books in the world are just reiterating the same thing over and over but contextualising it differently. The trick is, he reckons, to find one that resonates with you. A quick read-through suggests to me that TAW is more self-help than creativity manual, but it’s got a reputation and I’m reading it as part of my artistic development, so it goes on the blog. All in all, I think I’ll definitely gain something from working through the book (even if it’s just shelf space after I pass it on), but only if I’m open to the ideas within and willing to put in the work. Each week concludes with a check-in, which I’ll be blogging about.